The Meadville Tribune and The Frederick News-Post, that is. Go ahead and click on the articles! Also google: baltimoresun mutts archives and type in "surfdog". Then check out the web article about me!! Wow, this is exciting!! I'm famous all over the place!! Here I am with Gidget Germain. We are at the booth for the North Shore Outdoor Circle at the 10th Annual Haleiwa Arts Festival. We were giving away seeds and great gardening advice. Luckily we were near the Performance Tent so we got to listen to great music all day long!! A note: Gidget is a famous author. She wrote "Kimo's Summer Vacation." She's one of my most inspirational friends! This Celtic Piping Band performed the opening act of the Haleiwa Arts Festival. They marched to the stage and played wonderful bagpipe music. What a great way to start the event!! Would you believe this fellow is the Superintendent of Education in the smallest county in California. (Can you find out which one it is?) He's also a performer-------he recites exciting poems he has written about cowboys and western life. I heard a few of his poems the following night and they were great!! Officer Mike took good care of me in the parking lot of the Haleiwa Arts Festival. He found a perfect parking spot for one of my best friends, Teacher Nancy. She's in the following photograph. Here is Teacher Nancy to the rescue. I had forgotten my business/postcards and she went to my house and brought some to me at the Haleiwa Arts Festival. What a pal!! I can always count on her! These beautiful dancers were just about to mount the stage to perform a "hula" or two at the Haleiwa Arts Festival. I was happy they agreed to hold me for a photograph! Did you notice the leis around their necks and heads? Dr. Ralph Hartman is holding me. We live on the same street. We didn't go down the slide together-------we were too wide! He's a surfer from Florida who has lived on the North Shore for many, many years. He always has a smile on his face and kind words to say! Lynn Nanni was taking a break from the stage and came to visit me at the North Shore Outdoor Circle table in the Community Tent at the Haleiwa Arts Festival. She is the Mistress of Ceremonies every year. She's always so happy and positive! I liked Taka. He talked to me for a long time. He was at the Arts Festival taking pictures for the Hawaii Visitors Bureau. Oh my goodness-------I had the most delicious lunch at this food booth. My mouth was so happy. They were serving all sorts of wonderful healthy eats------purple sweet potato salad, freshly grilled ahi, ginger lemonade, homemade chocolate cake with coconut icing. Oh my, there were so many wonderful choices. Randy Brown, the lady in the picture, and her daughter, Emily, are just starting a business of catering, or making and delivering food to parties, or just bringing meals by. We are lucky to have such a great cook on the North Shore!! Jeff Lee is a famous potter in Hawaii. He was one of many artists selling his creations at the Festival. He thought I was prettty cute!! This is Chloe. She was making a pot on a "wheel" next to Jeff Lee (the potter in the photograph above) in his tent. Her hands were very sticky with wet clay, but she was loving every minute of building a pot. Ilona and Mike Hemperly have been creating art for many, many years. Ilona has published a children's book, too. It's called KITE ISLAND. Their work reflects beautiful images of our island life. They also sell their art at the Farmer's Market at Sunset Beach Elementary every Saturday morning. This gentleman had his hands full. He had three young dogs who were very curious. He is a CNN photograper who was at the Festival taking pictures. He thought I was a good idea! He said he was going to put me on t.v.!! Well, this new friend sure got to see the sights from up high! This fellow, Bob Leinau, is always telling jokes and making people smile. Just look at his funny, rainbow moustache!! He was at the face painting booth at the Haleiwa Arts Festival. Jane has on a very cool sweatshirt with me on the back! I will be introducing a line of clothing in the early Fall. It will be fun! Then lots of people will learn about me and be able to follow my adventures! Home again! Here I am at a party at the old dairy we call Lani Moo. I have a lot of older friends. This group of musicians was entertaining the crowd. The band is called "The Famous Unknowns." The fellow in the white t-shirt, Skip, was celebrating his 60th birthday. They played "rock and roll." It made me want to dance!! On many Saturday afternoons, I'll listen to KTUH. It's the University of Hawaii's radio station. My pal, Kevin Scott, is a substitute disc jockey there sometimes. Last year and years before, he had his own show EVERY Saturday afternoon. I wish he still did. He plays really great music!! And he takes requests! Yikes---that Wooly Mammoth is a little too close!! Luckily, Mom's here to protect me. I'm at the Page Museum in Los Angeles, California. This is the site of the La Brea Tar Pits. There is a tar pond outside of the building with a big cyclone fence around it. On top of the tar, in some spots, there are water slicks. For thousands of years, tar has come up through cracks in the Earth's crust and filled the pond. When it rains, the water pools on top of the tar. Long ago, prehistoric animals would come to the "watering hole" for a drink. Then, uh oh, they would slip down into the tar and become trapped in it. There are more fossils here than in any other place in the world!! Google: "La Brea Tar Pits" and find out more! I sure do look little compared to these Saber-toothed Tigers!! Charlie was entertaining folks outside the Page Museum in L.A. His tunes were old American folk songs. His music made me happy! And so did his smile!! Brad Dawn was showing me around his shop. He has one of the oldest and largest silk screening operations in Los Angeles. He was giving me tips about making t-shirts and other clothing items for my "product line." It was very exciting to see all his employees at work. He has 75 people who work for him! He's the son-in-law of Mom's good friend, Dave. So here I am with Mom. I'm so tired, I'm about to fall out of her arms!! The train was three hours late into Los Angeles. Remember what I said---expect delays!! Luckily, we were able to catch a bus to the airport and rent a car. It only cost a few dollars and, best of all, they didn't charge for me!! I think I crawled into bed and fell asleep about 3:00 am. That's pretty late hours for a little dog!! It was late afternoon in early July as we headed towards Los Angeles. These are the foothills of Santa Barbara, California, on the Pacific (my ocean) side of the Rocky Mountains. The hillsides were golden. My one big tip for train travel: EXPECT DELAYS. Lola, on the right, and Stacye, are neighbors who were traveling south from Portland, Oregon, after vacationing in the Northwest. They were heading home to Los Angeles. We ate lunch with them and ended up talking for almost three hours. The Dining Car attendent had to ask us to leave, so the wait staff could set up for dinner!! And, guess what, we were seated at the same table with them that evening!! More talking!! "Riding on the rails" is a great opportunity to make new friends! This is the last train I rode on my summer vacation. Doesn't it look sleek and clean? This is the train station in Portland, Oregon. We ended our ride from Chicago on the "Empire Builder" and were about to board another train called the "Coast Starlight" which travels south along the Pacific Ocean. We had two hours before our departure, so we explored the town looking for lunch. Well, we found a great place in Portland to have lunch. Every Saturday and Sunday, the whole town flocks to the "Market." It was about six blocks from the train station. There were lots of booths with tasty food. Also, there were many craftspeople selling their wares. This fellow, Jeff, made flutes. He loved me! His parents are teachers and he adored the fact that I was traveling the country and reporting about it on this blog. He enthusiastically put me in the middle of his flute display and played away. My dad, Bobby, bought one of his instruments! Now the train is rolling along the top of the northwestern United States. We were passing through the Columbia Gorge and had just seen many windsurfers at a town called White Salmon, Oregon. Look really hard and you can see a freight train on the other side of the river. Those are the trains that make my train, the Amtrak, stop and pull over so they can pass. Do you see that snowcapped mountain in the background? Can you find the name of it? It starts with an "H". Another mountain in the area is called Mt. Adams. Google: Mt. Adams Reindog Parade. It's pretty cute. Maybe some day I'll go there, put on a pair of antlers, and join in the festivities! During most of our journey across the country, the train was rolling along on its tracks. Sometimes, though, it had to pull over and let freight trains go by. In that case, we might have had to wait for an hour or two at a standstill. Once we had to wait for four hours. (A switch had broken AND freight trains had to get by!) And you can't get off the train, no matter what! This old steam locomotive was on display at a "scheduled" stop along the route. Did you notice the ladder? What about the Christmas lights? Now an interesting fact about train travel is that you always eat your meals with strangers. The Dining Car seats four people to a table and every table is always filled. So........I always ate with two new people every time I sat down------breakfast, lunch, and, dinner. I met a lot of very interesting people in my travels. This young couple was visiting family in the United States. They live in the country of Paraguay on the continent of South America. They teach children at an international school in the capital city of Asuncion. Maybe I will visit them someday. See if you can locate "Paraguay." A clue------it's landlocked! Hmmmmmm, now what does that mean? We caught the train out of Pittsburg the night before and made it to Chicago in about ten hours. It sure was fun sleeping on the train, but sometimes it was a little bouncy, especially when riding on the top bunk, and guess where I was riding? We were so lucky to have arrived in Chicago in the morning. We had about four hours to explore the city before our train departed for the West Coast. By chance, there was a big feasting event going on in the town. It was called "A Taste of Chicago." Lots of restaurants had set up booths and were selling food and drinks. The city provided free open-air trolley service for tourists to points of interest all over Chicago, and one of them was going to this event, so we hopped aboard and had lunch there. It was close to the downtown section of the city, so lots of businessmen and women were having lunch there too. Boy, were there lots of yummy choices! By the time we had to leave and head back to Union Station, my tummy was so full it was ready to burst!! Can you google "Chicago" and find which Great Lake borders, or touches, the city? This is a globe created by children from around the world. It was on display on the first floor of the Sears Tower in Chicago. There were many other globes there too. The purpose of the globe art was to bring awareness to the Earth's problem of becoming too warm. The project was called "Cool Globes." google: "cool globes" then go to: kids and teachers then go to: paper mache globe. Make a globe and have fun!! Think about how you could make the Earth cooler!! When we were walking back to the Chicago train station, we heard wonderful music. There was an outdoor concert going on in the heart of the city. Four times a year, lawyers and judges play in the square across from the very tall courthouse building. This afternoon was their summer performance. It was free. I thought it was a great idea! Can you spot the saxophone? You might have to enlarge the photograph!! The Best Frozen Custard in the World!! Conneaut Lake is a pretty remote, or far away, place, but if you are ever in northwestern Pennsylvania, please make sure to visit there and stop in at Hank's. This "soft ice cream" shop has been in business since 1950. It opens in the late morning in the summers and closes at 10:00 pm. It always has a line, no matter what time of the day it is. It's an incredibly popular place. Mom's favorite flavor is chocolate. Mine, too!! Now if you look very closely, you will see hundreds of fish. They all have their mouths open!! They are waiting to be fed bread. Yes, bread! People come from all over the world to feed them. This place is called the PYMATUNING SPILLWAY. It's at the most popular state park in Pennsylvania. It's famous because "the ducks walk on the fish!" I'm glad Mom didn't drop me in the water. Yikes------I look like a loaf of bread, and I am sure I would have been gobbled up immediately! Remember when I told you about President Abe Lincoln splitting logs with an axe as a teenager. Well, nowadays, in these modern times, it is a lot easier. This young woman is in her front yard using a machine to split logs. She had trimmed a big tree, cut the limbs into 2 foot sections with a chain saw, and was using a gas-powered log splitter. She was making firewood for the winter. Did you notice the big pile of logs behind her? This is my friend, Teddy. We are reading a story on a rainy afternoon at the little library in Conneaut Lake, Pennsylvania. Wasn't that kind of Teddy to share his book with me? I was telling him about my very favorite story, Caleb and Kate, by William Steig. Why don't you find it at your public library? Ask the children's librarian to assist you. The lady in the pink pants is Betty Ecklund. She is the librarian at the Conneaut Lake Public Library in northwestern Pennsylvania near Lake Erie. She welcomed us with open arms! 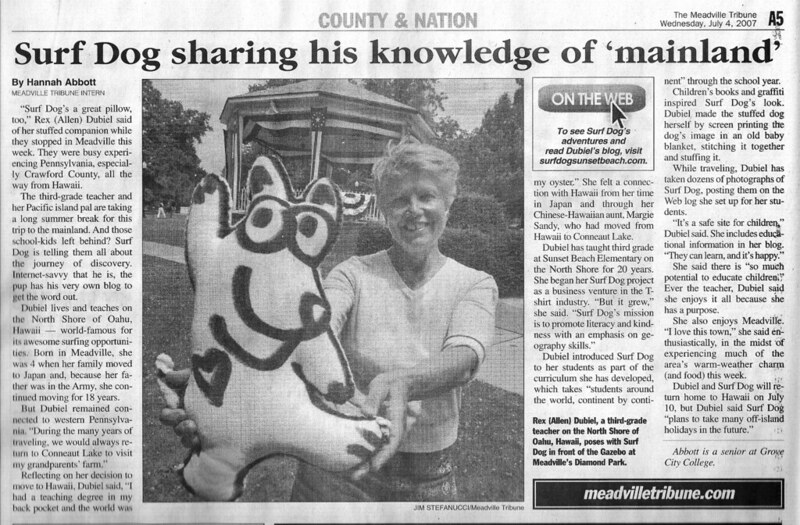 She had read about me the day before in the local newspaper, the Meadville Tribune, so she knew who I was. She called me a "celebrity." That means I'm famous!! She was so happy to show me around the library and tell me about the summer reading program she had set up for children in the neighborhood. The other lady standing next to her was returning books and was happy to talk with me, so we asked her to get in the picture with us, too. I saw this kind of sign as we traveled across America and back . It tells the viewer that a place is special. Next to this sign is an old brick building, and inside there are things to eat made by the local farmers. There are also crafts to buy. (Mom liked that.) This structure is the oldest farmer's market in continuous operation in the state of Pennsylvania. That's old!! Outside, under a wide, wide extended roof, the farmers had their tables filled with great fruit and veggies. See what I mean in the next photograph!! There were beautiful fruits and vegetables at the Market House. Mom liked the handwritten 3X5 cards showing the price. How much would I have to pay for nine zuccini squash? I have a great idea! Google "zucchini" and see what recipes you can find. I've had delicious bread made from the green ones in the photograph! This is Larry and me. He's smilin' big for me. He's just fed Mom and Dad a yummy breakfast at his grill at the Market House in Meadville, Pennsylvania. His restaurant was busy all the time. It was a great place to eat and make new friends. Did you notice the automatice milk dispensing machine behind me? Cool, huh? It's what is called an antique. Something old that has a lot of value. It's too old to work! Here I am on my very first boat ride!! That's Janice, my nurse friend, steering. She owns the boat!! We are on Conneaut Lake, the largest natural lake in Pennsylvania. (Two wooly mammoth skeletons were found at the bottom of this lake a few years ago.) I had fun riding around the lake in the late afternoon summer sun. It reminded me a little of my own island home! Yikes, I'm Up Really High! !